This spring we have the privilege of working with the After School Program at Lighthouse Community Charter School in Oakland to explore tinkering and making in after school time, and how it has the potential to make connections with learning in outside experiences (you can read more about the project here). Since we have the week off of program for spring break Jean and I thought it could be fun to try an "experiment in blogging" and share our reflections on how things have been going so far. Lianna: One of my favorite aspects of this project is that it's a research and practice partnership between the Exploratorium, Lighthouse, and the University of Washington. For me, I've had lots of opportunities to be on the development and implementation end of workshops, and this experience is a great learning opportunity in another lens to examine our work. One example is re-reading the fieldnotes Jean takes each week. As a facilitator, I get a glimpse into interactions that are happening in other parts of the room. It's an opportunity to "see" techniques my co-facilitators are using, and the impact it has on students. Jean: Yes! The collaboration across organizations and blending of research with educational practice are some of my favorite aspects of the project too! I am learning so much as a researcher conducting ethnographic observations in Lianna's afterschool program led with Sarah and other Tinkering Studio folks: not only from the students as they tinker and the facilitators as they teach, but also from the process of trying to document all that is going on in a way that can be useful and meaningful for Lianna, Sarah, other teachers, and the students. For example, when I share fieldnotes with Lianna and our Tinkering Studio team, they always give me feedback about both structural and content aspects of the fieldnotes that can help improve the ways we make sense of the learning and teaching going on in the program. I have learned that in order for my fieldnotes to be accessible to people outside my brain, there is a careful balance that must be struck between dialogue and imagery/photos for illustrating interactions between children and other students, children and materials, etc. I have also learned that when attempting to engage in joint analysis of fieldnotes with Lianna or others, sharing the entire fieldnote is not necessarily useful. In fact, the fieldnotes (that describe lots of details over 25+ pages) can be overwhelming to readers (surprise surprise)! Another piece of helpful feedback I received from Lianna just last week was that including more "observer comments" exploring my personal analyses and subjective reactions to activities and interactions can be helpful for her for delving into other ways of seeing interaction or organizing activities. We agreed that these researcher "observer comments" could serve as a useful point of entry for conversation between educational and researcher perspectives. In response to these early stage experiences looking at data together, Lianna and I are going to experiment with joint analyzing different kinds of documents that build on aspects of my fieldnotes but do not necessarily involve reading entire fieldnotes. I am excited to develop this new genre of documentation with Lianna! Lianna: Jean, I'm so glad you brought up the observer comments because I think they're an interesting tool for delving into our practice. When facilitating groups you don't often get the chance to get feedback or insights into your actions and how they have an impact on student learning. We'll often debrief after the fact, but it's based on memories of our experiences. The observer comments in the fieldnotes have an immediacy to them that feels different than post-program reflections. 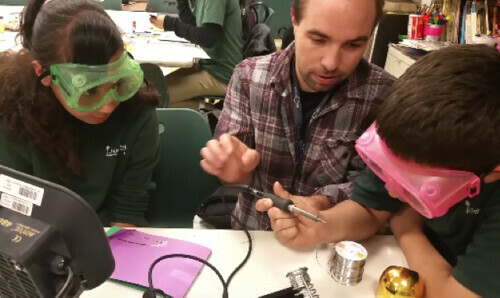 One comment from last week's fieldnote was related to how a student immediately picked up a facilitator's suggestion for testing his circuit, and quickly started using those techniques to test other challenging spots as well. It's the kind of moment you miss when you help someone troubleshoot then move on to helping another student, but by having the fieldnote with your comment highlighted, we're able to notice these moments, and hopefully see future instances of similar practices. Another thing you brought up that I'm excited to keep experimenting with is different types of documentation. We're very inspired by the work done in Reggio schools in Italy, and I’m curious to see how different approaches to fieldnotes will encourage us to notice different things. Incorporating them into our weekly reflections will also play a huge role in helping us determine what types of documentation help provide immediate feedback for impacting the student experience in ASP. I feel incredibly privileged to get to receive feedback from Lianna and others on these fieldnotes. At first I was excited about the fact that Lianna, Sarah, and others who have been present during the afterschool program might be able to correct anything I may have misinterpreted or misrepresented in the fieldnotes. Having the input of educators in the room could make the fieldnotes richer and provide insights that I may have been unable to notice or capture at first writing. However, I now realize the ways different aspects of the fieldnote can be a springboard for conversation as well - not just feedback or input. I mean, this seems obvious to me now, but for some reason I didn’t think about the potential for dialogue earlier! In our next blog, let’s try a mini-example of conversing around fieldnotes! Lianna: I love that idea! We'll be trying a brand new activity next week, so it'll be the perfect opportunity to reflect on not only the nitty-gritty details of new activity development, but also potential learning opporturnities and challenges for upcoming weeks. This collaboration is funded by the Overdeck Foundation and the National Science Foundation.